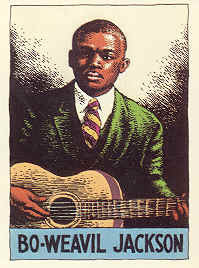 Bo-Weavil Jackson is one of those mythical blues musicians who record a few tracks under a few different names (Sam Butler was his Vocalion Records name) but are so unique that those few records are all it takes for their names to be remembered as one of the blues greats. Jackson is a brilliant and unusual guitar player who plays it fast and precise while shouting/speaking the lyrics just as fast, but not nearly as precise. Honey turned two (14 in dog years) yesterday and I was so busy getting ready for the party today that i forgot to post! I’m working on getting all the bonus stuff backup and running, but dreamhost isn’t letting me configure that directory like I want it to be so I’m looking into other ways of allowing people to access that information. More songs by request today – King Solomon Hill’s My Buddy Blind Papa Lemon/Times Done Got Hard is one of the rarest 78s with only one known copy in existence. Luckily the good fellows at Yazoo got the owner of the record to allow them to record both sides and spread the two songs out across their sprawling collection of rural southern music compilations “Times Ain’t Like They Used To Be.” Both songs are excellent country blues recorded by Paramount in 1932. Ruby Smith was one of Bessie Smith’s proteges and sounds pretty much just like her. This of course isn’t a bad thing, but over the course of Ruby’s half a dozen recordings she didn’t do much to really distinguish herself from the countless Bessie Smith sound-a-likes. That’s not to say she isn’t good, she’s very good and this track Hard Up Blues shows off her talent and has some pretty great lines. I don’t think I’ll ever get tired of blues piano – and hopefully ya’ll won’t either. Romeo Nelson is only known a for a few things, one is for writing some of the dirtiest blues songs of the pre-war era the other is for this song Head Rag Hop. The dirty blues songs are fun of course, but this side shows what an incredible talent he was on the keys – it retains his quirky sense of humor intermixed with his outstanding piano playing. I’m back from Nashville and I’m happy to report that the son and mom are doing very well and that the baby is incredibly cute. I’m an suggestion that they should name their kid “Kid Stomy Weather,” in tribute to the great lost piano blues player, but they didn’t take me up on it. Maybe when I have kids. Kid Stormy Weather recorded two songs in 1935, but was a local legend around New Orleans for playing in the barrelhouse bars down there. He has this big loud voice that dominates the mix which should of been tamed, but his piano breakdowns are so quick and good it really makes up for anything else. He easily has the quickest hands I’ve heard in a pre-war piano track.